shafiee, H. (2014). Development and validation of the computer-based word dot-probe task for investigation of the effect of attentional bias on social anxiety. International Journal of Behavioral Sciences, 8(2), 149-154. Hassan shafiee. "Development and validation of the computer-based word dot-probe task for investigation of the effect of attentional bias on social anxiety". International Journal of Behavioral Sciences, 8, 2, 2014, 149-154.
shafiee, H. (2014). 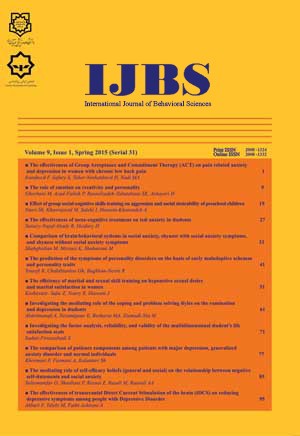 'Development and validation of the computer-based word dot-probe task for investigation of the effect of attentional bias on social anxiety', International Journal of Behavioral Sciences, 8(2), pp. 149-154.
shafiee, H. Development and validation of the computer-based word dot-probe task for investigation of the effect of attentional bias on social anxiety. International Journal of Behavioral Sciences, 2014; 8(2): 149-154. Introduction: Attentional bias plays an important role in the etiology and persistence of various disorders, especially social anxiety disorder. Dot-probe task is an appropriate cognitive instrument for the examination of attentional bias. This study introduces dot-probe task along with the construction process and the examination of reliability and validity thereof as well as words which were used as stimuli.Method: Primary list of socially threatening words were created using research literature related to social anxiety in addition to the guidance of psychologists and linguists. The words’ extent of being threatening was rated by 113 students. Then, 32 words at the highest rate of being socially threatening were selected and matched with neutral words in terms of frequency of use and number of letters. The validity and reliability of computer-based word dot-probe task was examined in a sample of two groups of 15 individuals with high and low social anxiety.Results: The results confirmed validity and reliability of the computer-based dot-probe task along with the socially threatening words. Besides, the results from administration of computer-based word dot-probe on two groups with social anxiety disorder suggested that the task could attain differential validity and was able to assess attributional bias as well.Conclusion: Computer-based word dot-probe task is an appropriate cognitive instrument for the assessment of attentional bias and it can be used in future researches to examine the patterns of information processing and attentional bias in patients with social anxiety disorder and other disorders.